After using traditional vocabulary and verb flashcards in my World Language classrooms for years, I have finally come to the conclusion that they just aren’t as effective as they could be. How many bizillions of flashcards have we forced our students to make, yet they still struggle to use the vocabulary and verbs correctly and fluently? Making flashcards is boring! Although writing the word once helps incorporate it a little into the brain, it is by no means going to make it a part of their permanent vocabulary. Traditional flashcards lack color, pictures or visual clues to help a variety of learning styles. How boring is it to just have the written word in English on one side and the word in the target language on the other side? 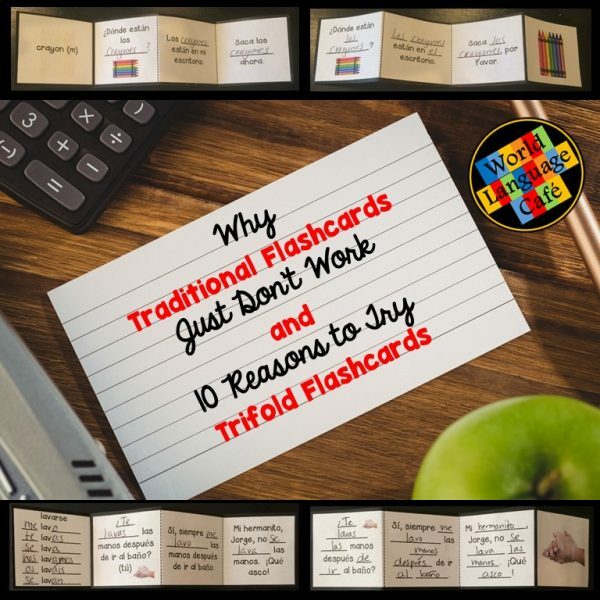 Traditional flashcards have no comprehensible input or context to help students learn how to use the word. Sure, they may end up learning the word, but then they still have no idea how to use it functionally in the target language. 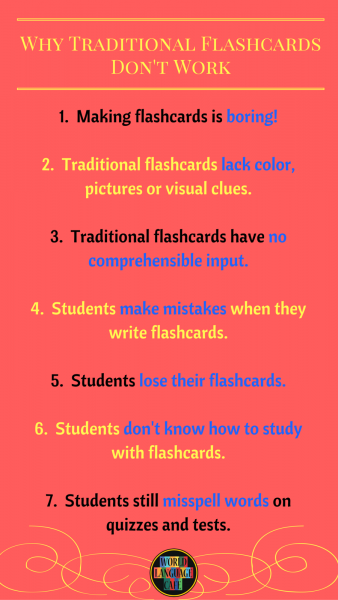 Students make mistakes when they write flashcards. They may misspell the word or write down the incorrect article to use with it. Students lose their flashcards. Johnny from class starts off with all of them, but how many of his flashcards end up at the bottom of his locker, hidden in the depths of his bedroom, or worst of all, in the garbage can as soon as the test or quiz is over. When it comes time to review for the final exam, most students have lost many of their flashcards. Students don’t know how to study with flashcards. Maybe they write the flashcards for a homework assignment and think they’re done. Or maybe they look at the word in the target language and say it in English. 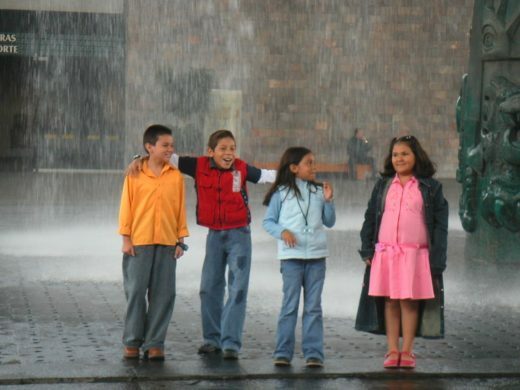 Very rarely do they make it all the way to looking at the word in English and writing the word in the target language. Students still misspell the words on their quizzes and tests because they haven’t practiced enough. After all the work you and they have put in to acquiring these words, they still can’t spell them or use them correctly in a sentence. Arg! Wow! That’s a lot of reasons not to use traditional flashcards, isn’t it? Had you ever thought about all these before? Makes you realize that this outdated language learning technique really doesn’t work well. Don’t worry – I got you covered and I have even included a free sample for you to test in your classroom at the end of this post! 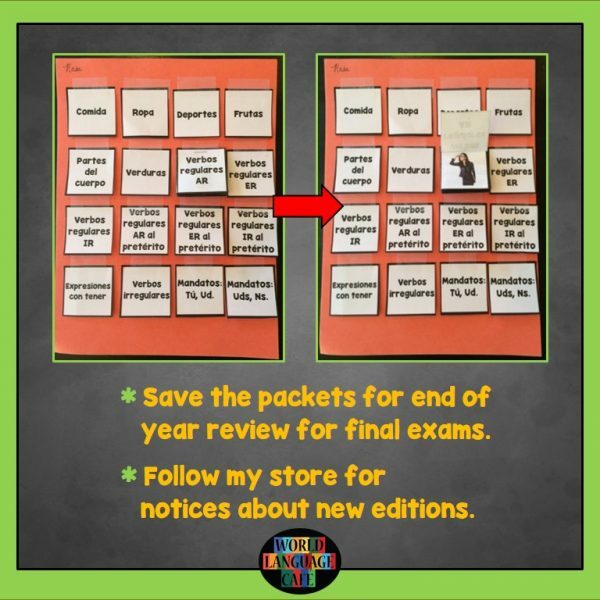 This past year, after pondering these dilemmas, I created a solution to these problems called interactive notebook trifold flashcards (INTF’s or INT’s). “What the heck are interactive notebook trifolds?”, you ask? Interactive notebook trifolds look like this. They are folding flashcards. On side A, students see the written word and write it into each of the three comprehensible sentences that often tell a short story or feature a mini-dialogue. On side B, students see the same sentences, but must now fill in more of the missing words in each sentence. Afterwards they write out the full three sentences on a sheet of paper or in their interactive notebooks and attach the booklet to the paper with paperclips. Students then look at the picture of the word and flip it so they can see the word in the target language. Such an easy way to review. By now, they have written each word at least 9 times in comprehensible sentences. Students see visual images of the words they are learning which help the words stick in their heads. Students write the words at least 9 times each so they are learning how to spell the words and adding agreement when necessary. Many fewer spelling mistakes on quizzes. 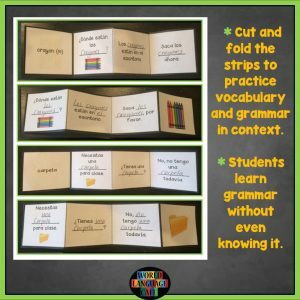 Each sentence is full of comprehensible input to teach other vocabulary and grammar points in addition to the vocab that they’re learning. Like sneaking vegetables into your kids’ spaghetti sauce. He, he, he! The words are already provided so students are less likely to make mistakes while they’re practicing. Students see the words are used in context. This helps them learn how to use these words correctly and fluently when they speak and write. Students create a mini review packet for final exams. After the quiz or test, students can cut off the first square of the flashcard and staple all the words together into a mini review booklet. They tape all of these to one page, so that at the end of the year, they’ll have mini-review packets for each theme or verb tense. Trifolds are engaging! With pictures and fun sentences, students stay engaged during the learning process. Students learn that they don’t need to know every word to be able to guess the meaning of a sentence. By reading these sentences with new vocabulary, students learn how to guess the general meaning of a sentence or dialogue – such an important skill for language learners. 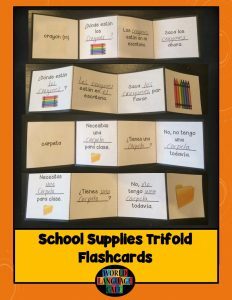 Trifold flashcards are super easy for you. Once your students have done one set of trifolds, they’ll know how to do them and will be independent learners. 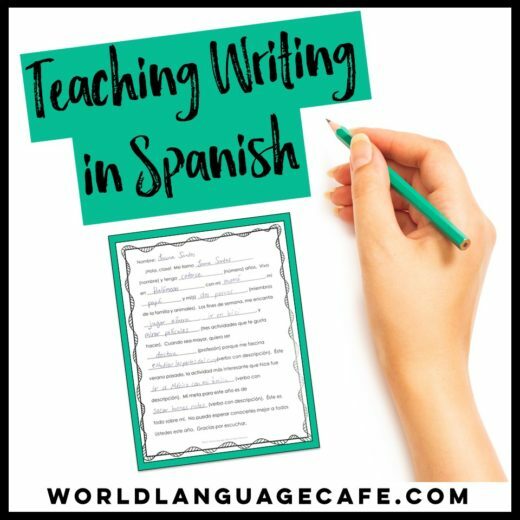 You can even leave them as sub plans (they come with sub instructions) and you’ll know that your students are learning the target language while you’re out, even if they don’t have a sub who speaks the language. Trifolds are great for differentiated learning. Have students who are fast finishers? Give them some extra words that maybe the whole class isn’t quite ready for. OR Give them a blank template and have them make their own trifold for a new vocab word or verb. 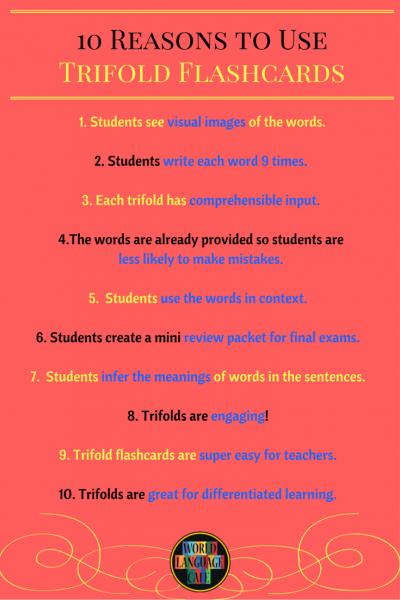 Hope this has given you some incentive to try trifolds in your World Language Classroom. 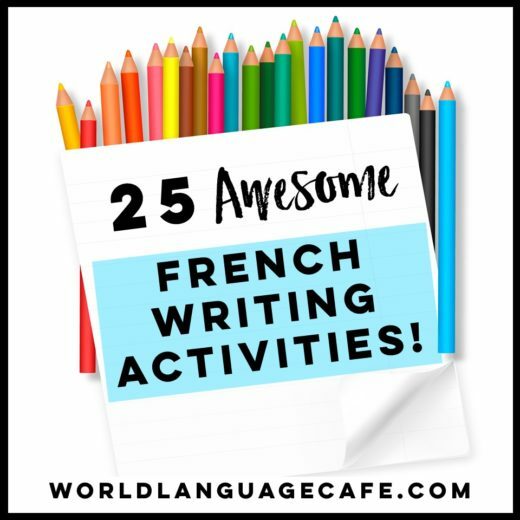 Get free sample sets in French or Spanish in my Free Resource Library. Sign up here. After you sign up, check your email for the password and access link. Here are the editions available in my store. 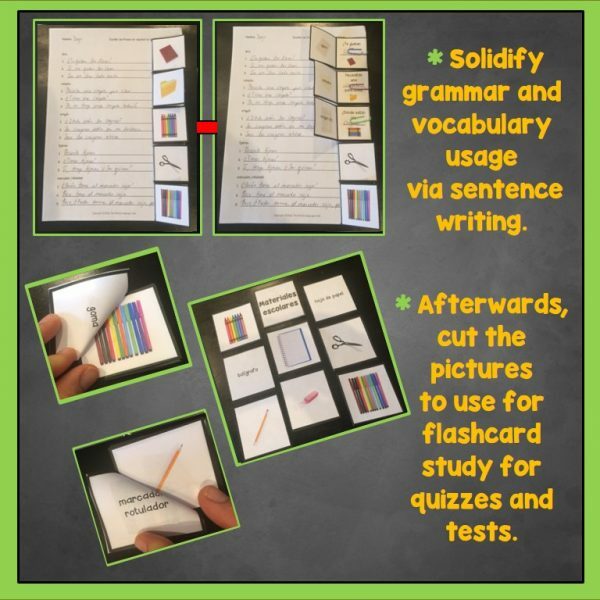 All interactive notebook trifold flashcards sets are between $2-$5, very affordable for your classroom, (or you can make your own – have to warn you though that they take a very long time to create). P.S. For more awesome freebies throughout the year, subscribe to my email list below.